When the snow fell last weekend, I welcomed it, not just for its beauty, but the way it stops time. I grew up in Minnesota, where children are hardwired to appreciate the beauty of snow and also to expect it as a normal rhythm of the winter, rather than a natural disaster. As an adult I am able to admit that snow is not just fun and games. I can’t decide what is more treacherous; the flat packed snow that forms a shiny, slick surface; the thick ice lurking under snow; or the thick salt crystals scattered over the sidewalks that sting my dogs’ paws. Even though snow trips me up, I still love it. Snow only falls a few times each winter in Maryland—but often it’s a storm, rather than a casual sprinkling. Supposedly it’s because of the freezing air coming down from Antarctic meeting up with the warmer Atlantic. And when we have snowstorms in Baltimore, we never have enough plows. In bad winters, the whole Eastern Seaboard runs out of salt and sand. In my city, the protocol is to concentrate on freeways and major roads while the storm is ongoing, and to address the rest of the city later. Or not. 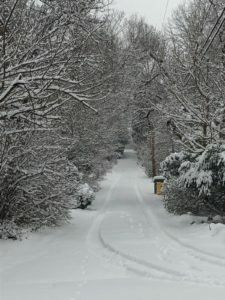 Last Sunday, when Baltimore was snowed in, a tremendous quiet descended over my world. I bundled up and went for a walk around nine in the morning with my husband. The streets and lanes had only a few car tracks. On my way back, I slipped on one of the slick snow patches on an unplowed street, but no lasting harm was done. Unspoiled snow gives the feeling of open time. It is the opposite of an ordinary day dominated by rapid-fire texts and emails demanding answers. The snow seems to wipe all of that out. This weekend’s snow came just before I started reading a book called Deep Work written by Georgetown professor Cal Newport. Dr. Newport examines what a lot of us already know: that toggling between different kinds of intellectual activities leads to a poorer quality of life and produced work. Using studies and examples of scientists, psychologists, tycoons—as well as his own hard-fought academic writing accomplishments—he talks about the need to limit shallow work that distracts from the deep snowbank of joyful, rewarding work. I’ve become very interested and inspired by this theory of deep work, though I cannot of course end my daily life as a person raising children and dogs, helping with my husband’s business, and keeping in touch with readers. But I know that I do many more distracting activities now than twenty years ago, when I was starting my fiction career. Now I understand why focusing was easier. One of Dr. Newport’s suggestions for managing smaller job-related responsibilities is to address them in batches rather than every day. For instance, I could write a couple of Murder is Everywhere posts over one day or two days and then I’d be ready for the month. In that same week of managing small writing assignments, I could write my monthly author newsletter and cue up some Instagram posts. And in the other weeks of the month—at least three!—I could immerse myself in 1921 Bombay, the very un-snowy setting of my current novel. So I’ve got an idea. Regardless of what the weather predictions are, a metaphoric storm is headed to my house tomorrow morning. It will be a white-out from the digital world. I aim to concentrate on my neglected next novel, which means I can answer email just thrice daily. And podcasts, radio and TV will have to wait two weeks as well. My mind doesn’t need any more jumbling. I intend to listen hard enough in the silence that I can hear snowflakes fall.